Thank goodness for Google cache. Oh, no! Now that's missing too? It's okay. We saved it here. 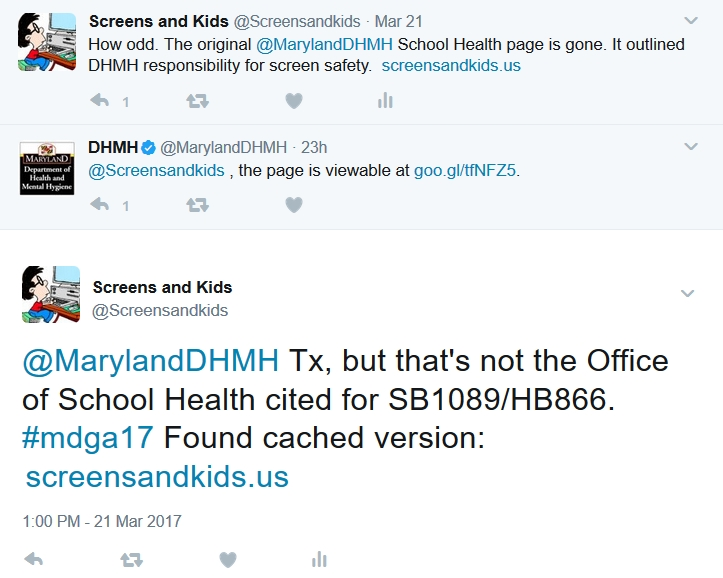 On March 10, 2017, members of the House and Senate Committees considering SB1089/HB866 were told of the DHMH responsibility for screen safety guidelines, as identified on the DHMH Office of School Health web page. But that page has disappeared. The classroom screen safety bill (HB866/SB1089 "Primary and Secondary Education - Health and Safety Guidelines and Procedures - Digital Devices") now being considered by the House Ways and Means Committee will be heard by the Senate EHEA Committee next Wednesday, March 15. This bill directs DHMH to create safety and health guidelines to address the serious health risks facing Maryland students, now that the children are using digital devices in school every day. OSHA has protected adults from many of the same health hazards posed by computer equipment for decades; doctors are quick to point out that the risks are more serious for growing children. Maryland students using digital devices in school every day now face increased myopia, permanent retinal damage, dry eye disease, headaches, sleeplessness, obesity, anxiety, addiction and more. This bill simply directs DHMH to craft guidelines for classroom digital device use specifically, because the school equipment poses serious medical risks to children, requiring professional medical oversight. MedChi and the American Academy of Pediatrics' Md. Chapter (MDAAP) endorse this legislation, recognizing "there is a growing body of evidence that there are serious potential health risks for children associated with excessive use of digital devices," and that "it is critical that health and safety guidelines be developed to ensure that those risks are accounted for in the use of digital devices in the classrooms." The medical community also underscores the need for consistent, statewide guidelines from DHMH and notes that "legitimately, the local jurisdictions don't have the time or expertise to put a framework together." 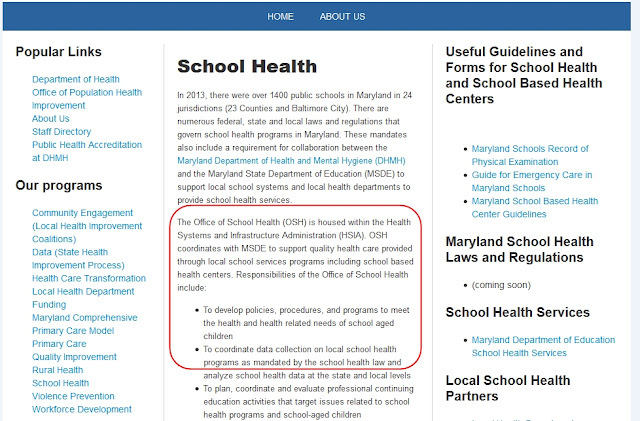 The Children's Environmental Health and Protection Advisory Council (CEHPAC) also endorses this legislation, recognizing that Maryland's children need to be medically protected from known health hazards. Children's advocates nationwide are anxiously hoping for its passage, as a blueprint for their own states. With 26 co-sponsors from across the state for HB866 , and both Baltimore County and Montgomery County Senators co-sponsoring SB1089, this legislation has broad bi-partisan support. The Fiscal Policy Note reports that the bill will not cost anything. More technology is becoming increasingly accessible to more and younger Maryland students, so it is critically important to direct the state's medical experts to protect them from avoidable harm. I hope you will help to ensure this effort is successful.